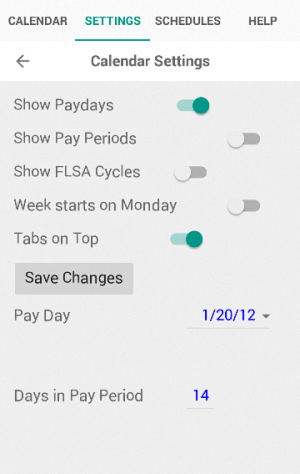 This is the basic calendar display and the "Settings" tab. 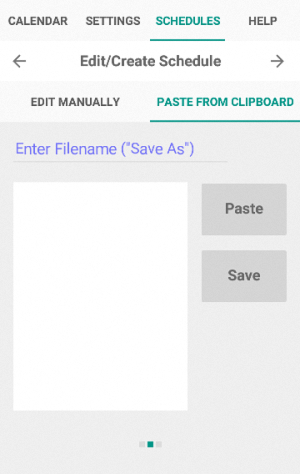 Changes to settings take effect immediately, but are not saved until the user touches the Save Changes button. Feel free to experiment; save your changes if you you want them to persist. 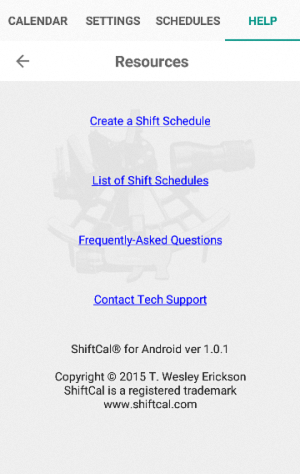 Shift schedules are created and edited from the Schedules tab. 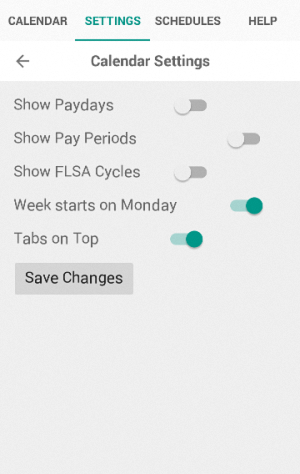 Create multiple shift schedules and switch between them at will. 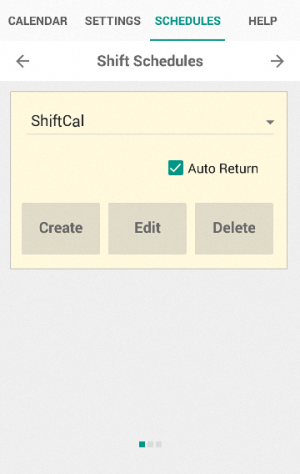 The program automatically loads a shift schedule named "ShiftCal" on startup (if it exists). If you are paid on a regular basis (e.g. every two weeks), turn the Show Paydays switch on to underline paydays. 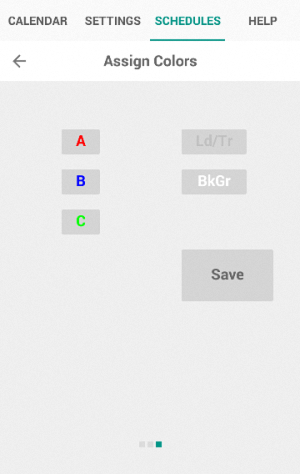 Touch the Save Changes button. Turn the Show Pay Periods switch on to display when pay periods end. Turn the Show FLSA Cycles switch on to display FLSA cycles. Turn the Week starts on Monday switch on to make Monday the first day of the week. Tabs are displayed at the top of the screen by default in Android. To move them to the bottom, turn the Tabs on Top switch off. Selecting the Schedules tab takes you to a second-level menu that allows you to Create, Edit, and Delete shift schedules. Existing schedules are always edited manually. 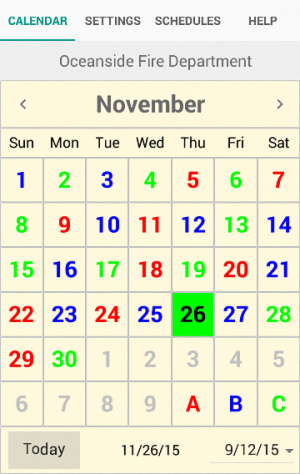 When you have created and saved a shift schedule, you will be redirected here to assign colors. Click on each platoon button and select a color for that platoon. Optionally, select a color for leading/trailing days ("LdTr") and a background color ("BkGr"). 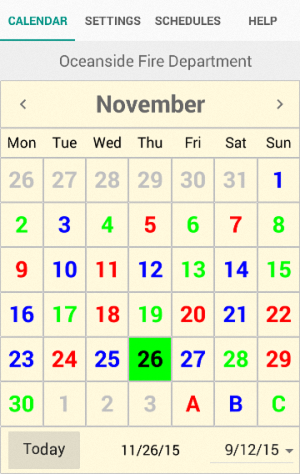 If you are defining a schedule with Kelly days, debit days, or RDO's, select an "X" platoon color. 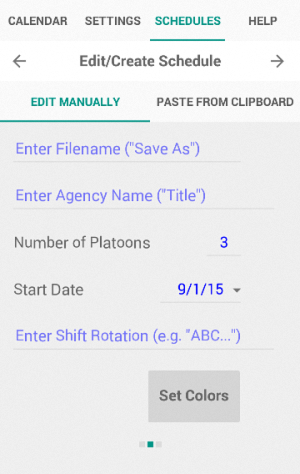 The Help tab contains links to online help and a list of shift schedules that can be copied and pasted into the Paste from Clipboard tab.